My amaryllis is blooming. It sits on the edge of my tub right by the bathroom door. 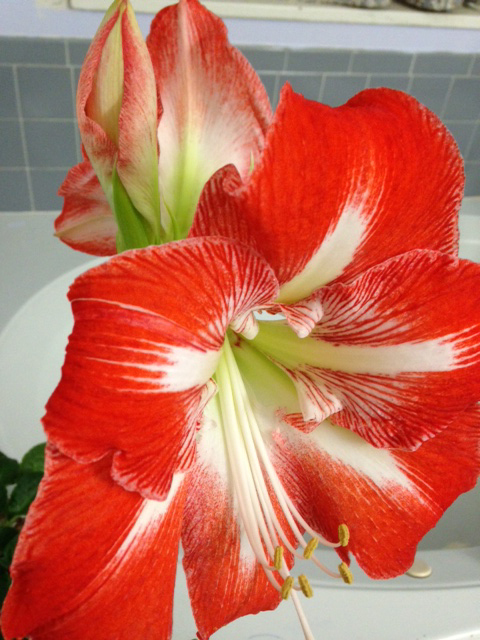 I can’t see it until I enter the bathroom, then it is right there, a giant beautiful flower. I keep being surprised by it, “Oh that’s right. I have a flower.” Life needs more big beautiful surprises in it, particularly in mid winter. This is why I wrapped everything in my room in leftover Christmas wrapping paper. Now every time I open my door I run into a pile of presents.